The name Italian Wedding Soup stemmed from the combining of meat with pasta. Growing up, in my home, pasta was served separately from the meat dish. This post will show you everything you need to know on how I make this soup. My secret ingredient, for the most flavorful meatballs, is basil pesto. Surprised!, don’t be, when you break down the ingredients in basil pesto, you’ll find that most of those ingredients are in my meatballs anyway. I have done variations of my Italian Wedding Soup like, instead of small pasta, I’ve used mini cheese ravioli. It’s really delicious way to give an extra surprise to the dish. I think whenever your making a recipe that calls for meatballs, it’s important that they are tender and full of flavor. 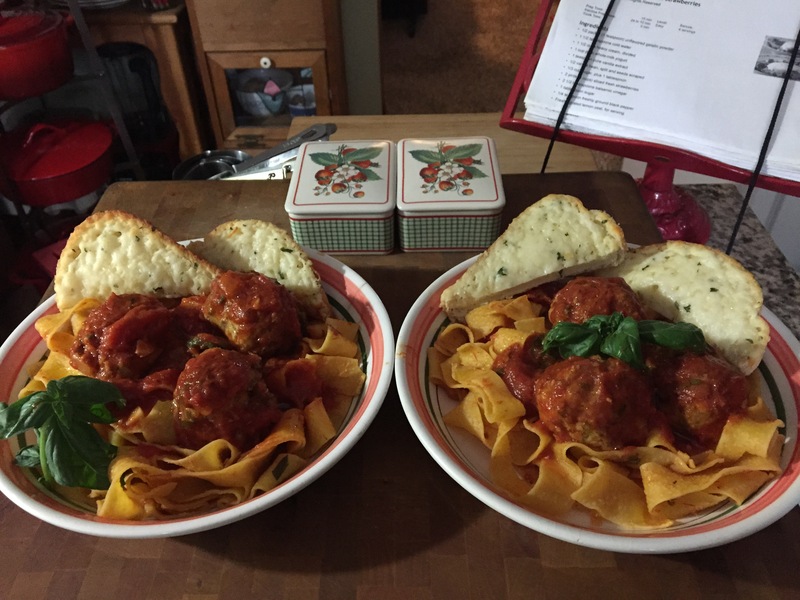 My basic recipe for meatballs is always the same, whether using ground beef, pork, turkey, or chicken. The exceptions are when I make a Greek or Asian dish that call for meatballs. That’s a story for another time. I’m going to show you two versions. One made with a short cut pasta called Ditalini, the other with mini cheese ravioli. What’s great about making extra is, you can freeze the soup for another time. First label and date the bags. Whenever I freeze a completed soup, I let it come to room temperature, transfer the soup into tight fitting zip lock bags. Release all the air possible, then close the bag. Lay the bag out onto a sheet pan in the freezer. Once frozen, remove the sheet pan and you can stack the bags of soup. I’m also making a double batch of meatball to show both versions of my Italian Wedding Soup. This recipe yields 30 meatballs. If you’re going to use half of meatballs, let them come to room temperature. Next, place them in the frig for 30 minutes to chill. Label and date the zip lock freezer bag transfer them to the bag, releasing as much of the air as possible, close it up and place into the freezer. The one thing that’s important when making meatballs, is to mix all the flavoring first. Once all the flavor ingredients are placed into a bowl, mix to combine. This mixture should have the consistency of wet sand. Then I’ll add in the ground meat. I’ll also use a fork in order to combine the flavorings with the meat. This keeps the meat light and tender. Taking a fork to combine the ingredients, takes a few minutes longer but it’s well worth it. Your meatballs will be light and tender. I line two baking sheets with parchment paper and allow a little space between the meatballs for even cooking. I spray the tops with a light spray of non-stick cooking spray to help them brown evenly. Bake at 375 degrees for 25-30 minutes. While the meatballs are cooking in the oven, I utilize this time for chopping all my veggies. To start, I have two heavy bottom soup pots on the stove set on medium heat. All my veggies ready to go. It’s the standard Mirepoix, onions celery, and carrots, along with some minced garlic. To each pot I’ve added some olive oil. I throw in the onions first to start them softening. Once they’ve started to soften I add in all the other veggies. At this point I season with salt and pepper. I let everything sauté for about 5-7 minutes before adding in the low sodium chicken stock. I’m using chicken stock, instead of broth, for a deeper chicken flavor. I’ve also kept the rind from the grated cheese that I added earlier into the meatballs. It’s great to throw them into soups and stews for depth of flavor. To both pots, I add in the chicken stock. I bring them up to a bubble, then reduce to a simmer. Now it’s time the meatballs come out of the oven. Carefully, add half the meatballs (15) to each pot. Let this simmer for another 10-15 minutes. Next, add the pasta, mini Ravioli to one pot, and Ditalini to the other. Give each pot a big stir. The pasta will start to float when it cooked, about 8-10 minutes. Lastly, I add one package of the thawed frozen spinach, that’s been squeezed really well of any excess water, to each pot and stir it around gently. Turn the heat off and cover until your ready to serve. Note: If only making one pot, use 1 1/2 pounds of ground chicken (15 meatballs) otherwise freeze the other 15 meatballs. Note: cut recipe in half, for one pot of soup, with the exception of the pasta. Choose which pasta you want to use. Use only 1-1/2 pounds of ground chicken for 15 meatballs. Start with a large bowl and add all the ingredients for the flavorings for the meatballs. Once everything is in the bowl mix well. You want the flavorings to have the consistency of wet sand. Next, add the ground meat to the bowl. Using a fork, mix the flavorings through the ground chicken. It may take a few minutes but your meatballs with be light and tender. Using a small ice cream scoop so meat mixture into your hand. This will ensure the meatballs will all be the size of golfballs. Line two baking sheets with parchment paper. Lay the meatballs on the baking sheet with space between each one. Lightly spray the top of the meatballs with non-stick cooking spray to ensure they will brown nicely. Place the meatballs in the oven. While they are cooking, dice all the veggies and mince the garlic. On medium heat, prepare your pot(s) with the olive oil and crushed red pepper flakes. Add the diced onions in. Let them start to soften before adding in the rest of the veggies. Give all the veggies and garlic a big stir and add the Kosher salt and black pepper. Let sauté for 5-7 minutes. Next, add the liquid. If you have the cheese rind, leftover from grating the cheese, go ahead and throw that into your pot(s). Bring the soup up to a boil then reduce it to a simmer. At this point, the meatballs will be ready to come out of the oven. Add the meatballs to the pot(s) very carefully. Let them simmer on med-low for another 15 minutes. Now it’s time to add the pasta. Throw in your pasta of choice, or both if you’re making two pots like I have. Carefully give the pasta a big stir. Let this cook for another 8-10 minutes. Once the pasta floats to the top, it’s time to add in the drained thawed frozen spinach. Again, carefully give the spinach a good stir to incorporate it through the soup. Turn the heat off and cover until your ready to serve. This traditional Italian vegetable soup has had a makeover. I’ve added chicken sausage meatballs to what was an already perfect soup. Now it’s even more delicious. I went to my butcher and had him grind up some boneless- skinless chicken breast for me. I add the ground chicken into a large mixing bowl and add the usual suspects for flavorings. I’m also going to add some whole fennel seeds to give it that Italian sausage flavor. I thought that the sausage flavor would enhance this recipe, but still keep it on the lean side by using chicken, instead of pork. I’m also going to post the ingredients for my meatballs here, this way, if you wanted to make this dish completely vegetarian, just leave the Pancetta and meatballs out. Replace the chicken stock with vegetable broth. The Ribollita would be just as delicious. Mix all the ingredients together, but do not over mix. Just once all the flavorings are mixed throughout the ground chicken. Line 2 baking sheets with parchment paper. Spray each one with non-stick cooking spray. Using a small scoop, make the meatballs walnut size. Spray the tops of the meatballs lightly with the non-stick cooking spray, and bake them off for 20 minutes at 375. They will have a golden crust and finish cooking in the soup, and absorb all the flavors from the broth while they are simmering away. Now for the star, the Ribollita. I always like to do my prep in advance of making any dish. I took the time to prep while the meatballs were baking in the oven. All my veggies are diced, the garlic is minced, and the Pancetta is diced. I have Cannellini beans the are rinsed and drained, half of the I purred in a food processor. All I did to do that was to add them to a food processor adding 3-4 tablespoon of the unsalted chicken stock to loosen then up so they would puree nice and smooth. I the Kale chopped, Savoy cabbage chopped, and the fresh basil chopped. I also have ground up the cheese and cubed some sourdough bread with the crusts removed. Twenty minutes have passed and the meatballs are out of the oven, on stand- by, waiting to be dropped into the Ribollita. Let’s get started. In a heavy bottom soup pot, I’m going to start sauteing the onions, on med heat, just until they are soft but not brown. Next I’m adding in the Pancetta. I cook those together for 3-5 minutes until the Pancetta has released some of it’s fat. Next, I add in the crushed red pepper flakes and a bay leaf. I stir the flakes around in the pan so it releases a little heat for this dish. Moving on, I add in all the veggies and minced garlic, along with some Kosher salt, and black pepper. I let this all cook together for 10 minutes until the veggies start to get tender. Now for some liquid. I’m adding in 1 can of San Marzano whole tomatoes. Stir that all around and then I add the kale, Savoy cabbage, chopped basil, along with some freshly grated nutmeg. I stir all this together and let cook for another 5-7 minutes, giving the cabbage and kale a chance to will down. Once the cabbage and kale have wilted down, I turn the heat down to med low. I add in the pureed Cannelini beans, stirring that through and letting it combine with the other ingredients. Now for the whole Cannellini beans. To that I add in the unsalted chicken stock and the chicken sausage meatballs. I let this simmer on med low for another 15 minutes, stirring occasionally. After the Ribollita has been simmering for 15 minutes, I add in the cubed bread and let simmer for another 10 minutes. Still stirring, giving the bread cubes a chance to dissolve and thicken the soup. Soup is ready to serve. I like to ladle the Ribollita into large soup or pasta bowl. Add a nice helping of the cheese that I ground up earlier on top. Finally a drizzle of the best E.V.O.O on the top. I promise, if you love a hearty vegetable soup, with some delicious meatballs, I would say to try making this dish. First start off with making the chicken sausage meatballs ( instructions are explained at the beginning of this post). Have them baking in the oven ( for 20 minutes) while you prep all the veggies for the Ribollita; Once you’ve prepped the veggies the meatballs will be ready to come out of the oven. Set them aside until you are ready to add them into the Ribollita. On med heat, start sauteing the onions in olive oil. Saute until softened but not brown. Add in the crushed red pepper flakes and diced Pancetta and let cook for 3-5 minutes. Next add in the veggies and minced garlic. Add in the Kosher salt and pepper and let cook together for 10 minutes until the, veggies start to soften. To the cooked veggies add the whole caned tomatoes with juice. Stir that through and then add in the kale, cabbage, and basil, letting this cook for another 5-7 minutes until the greens have wilted down. Turn the heat down to med low and add the pureed Cannellini beans. Stir the pure through and then add the whole beans. Next, add in the unsalted chicken stock. This is the point where you would add in the meatballs that were baked off earlier. Simmer, still on med low for another 15 minutes. At this point add in the cubes bread and continue simmering for another 10 minutes. Ribollita is done at this point. Garnish with fresh grated Parmigiano- Reggiano cheese, and drizzle with good E.V.O.O.